This is an original artwork for a fashion illustration by Marcel Fromenti for The Lady, a weekly magazine for women published since 1885. At the time it was made, Fromenti was the main artist for The Lady's fashion articles. The glamorous women in his drawings modelled both couture and high-end ready-to-wear garments with equal panache and elegance. Couture dresses and suits by leading Paris and London couturiers such as Christian Dior, Pierre Balmain and Norman Hartnell were drawn with the same flair as designs from British ready-to-wear labels such as Susan Small, Roecliff & Chapman, and Marcus. The articles described the fashion developments of their day in simple, accessible terms that contributed greatly to The Lady's popularity with its readers. Pencil notes record the designers, fabric and colour details, alongside technical instructions to the printers as to how these images should be incorporated into the printed page and at what scale. Fromenti did not usually draw Paris and London designs on the same sheet. 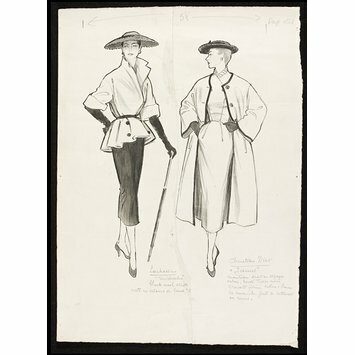 These two outfits, one by the London couture house Lachasse, and the other by Christian Dior of Paris, were drawn on separate pages, and afterwards joined by the publisher. The Lachasse suit, which is called "Michael", features a slim black pencil skirt with a light-coloured jacket with deep flared peplum, tightly belted waist and fitted bodice. This tightly cinched silhouette was made popular by designers such as Christian Dior in the late 1940s, although the Dior outfit, which is called "James", shows how Paris couturiers had moved on. Whilst the Dior outfit features a simple, fitted sheath dress, it is worn with a loosely fitted, collarless swing coat showing the more natural, relaxed silhouette towards which Parisian tailoring was moving. Lachasse was founded in 1928 by Frederick Shingleton with Digby Morton as head designer until 1933. Hardy Amies succeeded Morton from 1933-39, followed by Michael Donéllan (1940 to 1953). Between 1953-64, the house was headed by Mr. Owen, and from 1964 until its closure in 2006, Lachasse was headed by Peter Lewis-Crown. Although Lachasse produced evening dresses, it was principally known for its stylish tailored daywear. Until 1981, when boutique and ready-to-wear lines were offered, the house operated on an exclusively couture basis, making all garments to order. Its 78-year run made it one of the longest surviving London fashion houses. NB: This description is for E.1572:1&2-1954. The record is for one of two parts. 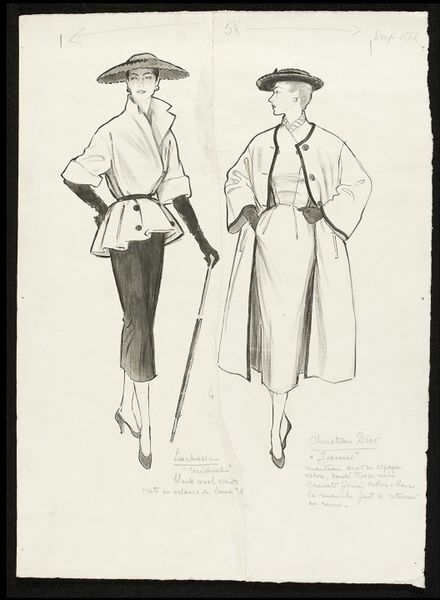 Joined drawing of two models in outfits by Lachasse and Christian Dior. On the left, a model in a Lachasse suit with a slim black pencil skirt and a light coloured jacket with wide turned-back sleeve cuffs, fitted bodice, belted waist, and a deep, flaring peplum with double-breasted buttons below the waist on the peplum. The model wears the lapels of her jacket turned up and wears long black gloves, a wide-brimmed black straw hat, and a tightly rolled umbrella. This suit is called "Michael", but this may be a reference to its being designed by Michael Donéllan, the house designer for Lachasse before opening his own fashion house in 1953. On the right, a coat and dress ensemble called "James" by Christian Dior. The loose, collarless swing coat with dark contrast binding at the edges of the sleeves and facings is worn open over a simple fitted sheath dress with a pencil skirt. 1 of 94 sheets of fashion drawings. Inscribed with the designers' names, descriptions in French, and dated on the back. 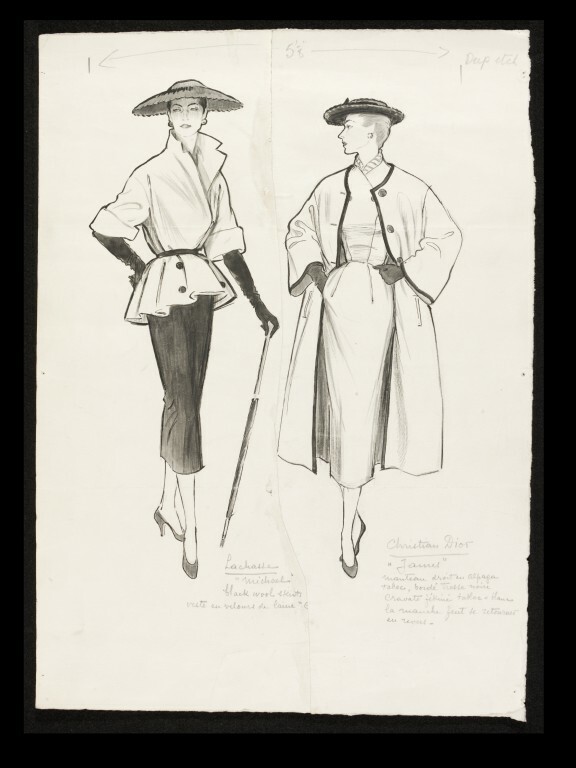 Joined drawing of two models in outfits by Lachasse and Christian Dior. On the left, a model in a Lachasse suit with a slim black pencil skirt and a light coloured jacket with wide turned-back sleeve cuffs, fitted bodice, belted waist, and a deep, flaring peplum with double-breasted buttons below the waist on the peplum. The model wears the lapels of her jacket turned up and wears long black gloves, a wide-brimmed black straw hat, and a tightly rolled umbrella. This suit is called "Michael", but this may be a reference to its being designed by Michael Donéllan, the house designer for Lachasse before opening his own fashion house in 1953. On the right, a coat and dress ensemble called "James" by Christian Dior. The loose, collarless swing coat with dark contrast binding at the edges of the sleeves and facings is worn open over a simple fitted sheath dress with a pencil skirt. Lachasse was founded in 1928 by Frederick Shingleton. Digby Morton was the head designer from 1928-1933, followed by Hardy Amies from 1933-1939. Michael (later of Carlos Place) was the designer from 1940 to 1953. The company was renowned for stylish tailored daywear and was headed by Peter Lewis-Crown from 1964 until it closed down in 2006.